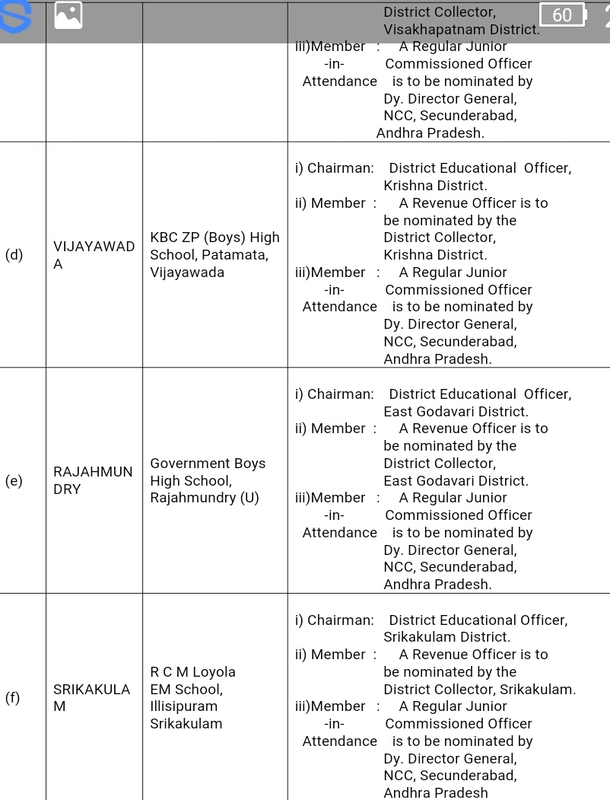 School Education Department - Sainik School, Korukonda – Entrance Examination for admission into Sainik School Korukonda for 2016-2017 Session – Constitution of Examination Board for Written Test, Interview and Medical Examination – Orders – Issued. From the Principal, Sainik School, Korukonda, Vizianagaram District (A.P) Letter No.SSK/1251/2/MO/EE/2016-2017, dated: 04.11.2015. 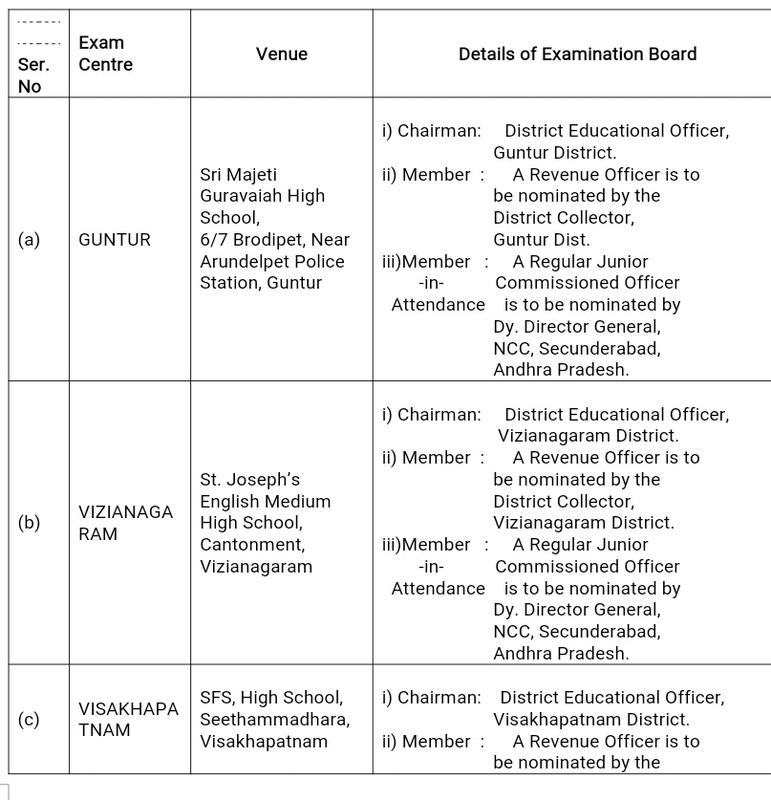 1.In the circumstances stated by the Principal, Sainik School, Korukonda, Vizianagaram District (A.P) in the reference read above, Government, hereby, appoint the following Examination Boards for Written Test for admission into Classes VI and IX scheduled on 03 Jan 2016 (Sunday) during both morning and afternoon sessions and for conduct of Interviews and Medical Examination of the candidates who qualify for the merit list to be held during Feb/March 2016 for admission into Sainik School, Korukonda, Vizianagaram District (AP) for 2016-2017 Session. The Principal, Sainik School, Korukonda shall appoint Teachers to each centre to assist the Board towards conduct of the written test. However, the District Educational Officer of each District where examination centre is located will be fully responsible for the smooth conduct of the above Entrance Examination. They will take custody of the Question Papers kept in a sealed Trunk and labeled as CONFIDENTIAL sent by the Principal, Sainik School, Korukonda through his representatives one or two days prior to the conduct of Examination and ensure safe custody of Question Paper Trunk. 2.Roll No. of all the candidates who qualify for ‘Merit List’ will be published in all the leading newspaper of Andhra Pradesh & Telangana. (a)Interview followed by Medical Examination will be held during March 2016 and may last for two weeks. (b)Sainik School Korukonda will intimate each candidate, who qualifies and whose name appears in the merit list, about the specific date and venue of Interview and Medical Examination. (ii)Member : (aa)A nominee of the District Collector of Vizianagaram District. 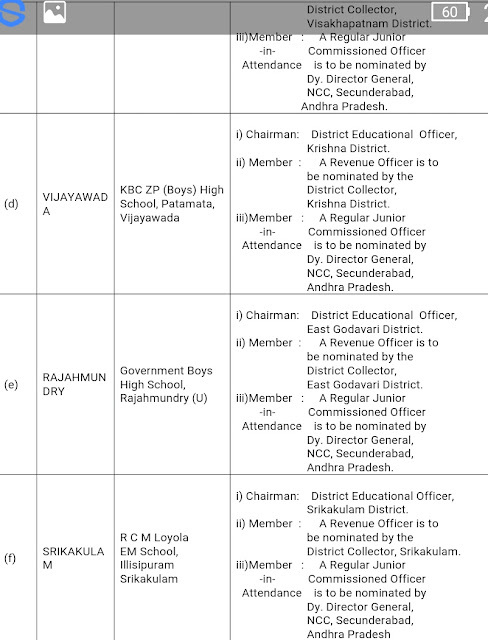 (ab) District Educational Officer of the Vizianagaram District or his nominee. (d)Conduct of Medical Examination. The Medical Examination will be conducted by the Medical Specialists from Defence Services / Govt. Civil Hospital. The Medical standards for entry into Sainik Schools are the same as that for the entry into the National Defence Academy. 4.Based on the results of Interview and Medical Examination a final merit list will be prepared by Sainik School Korukonda and the same will be published in all leading news papers of Andhra Pradesh & Telangana. 5.Principal Sainik School Korukonda at his discretion is empowered to cancel any of the examination centres, in case sufficient number of candidates (i.e. minimum 100 candidates) do not opt to appear from a particular examination centre.